Yes, I admit, I go pumpkin-crazy in autumn. What's not to like?! Pumpkin is a nutritional superstar equally at home in savory and sweet dishes. Here, I used a bit of canned pumpkin to flavor the homemade tortilla recipe I shared a few weeks back. You can use the same approach to flavor your tortillas with spinach, tomato, red pepper and more — homemade flavored wraps, made to order! Pumpkin gives these tortillas a gorgeous, saffron color. 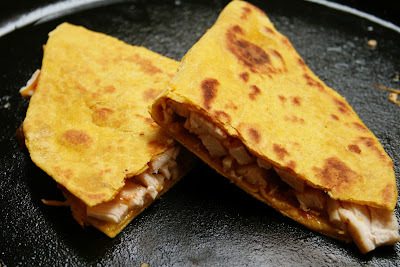 I enjoyed mine as quesadillas stuffed with smoky salsa, grilled chicken, and Monterey Jack cheese. If you really want to earn your Super Mom merit badge, cut pumpkin shapes with a cookie cutter and use those to make quesadillas. You also could use them to make tostadas with black beans. As I noted in the original post on making tortillas, my recipe makes no claim to authenticity. But it's relatively low-fat, uses a healthy amount of whole wheat flour, and comes together easily. It's a little bit of effort, but so worth it! Pumpkin tortillas make terrific quesadillas! These are a little stiffer than my plain tortillas. You might want to add a little more olive oil, or rub a few drops on your hands when you knead the dough. Stir together flour, baking powder, and salt with your fingers or a fork. Drizzle the oil over the dry ingredients and blend well. Measure pumpkin into a liquid measuring cup. Add warm water until the total volume is 3/4 cup. Purée with an immersion blender until the pumpkin is fully incorporated into the liquid. 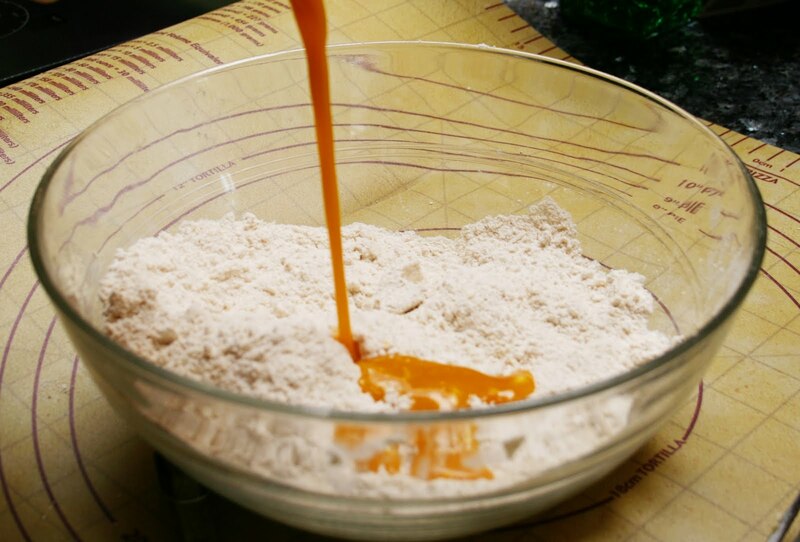 Add the pumpkin and water mixture to the dry ingredients, a spoonful or two at a time, mix in, and repeat until the dough starts to come together in a shaggy ball. You might need a little more or a little less water. Turn the dough out onto a lightly floured surface and knead for a few minutes until it’s smooth and elastic. Divide into 8 to 10 pieces and roll into balls—about the size of ping-pong balls. Heat a skillet over medium heat. Roll a ball of dough out into a very thin circle, about 7 to 8 inches. If the dough is resisting, cover and let it rest for 10 to 20 minutes. Put the rolled-out dough onto the heated skillet and cook for about 15 seconds; you should see some puffy spots and browning. 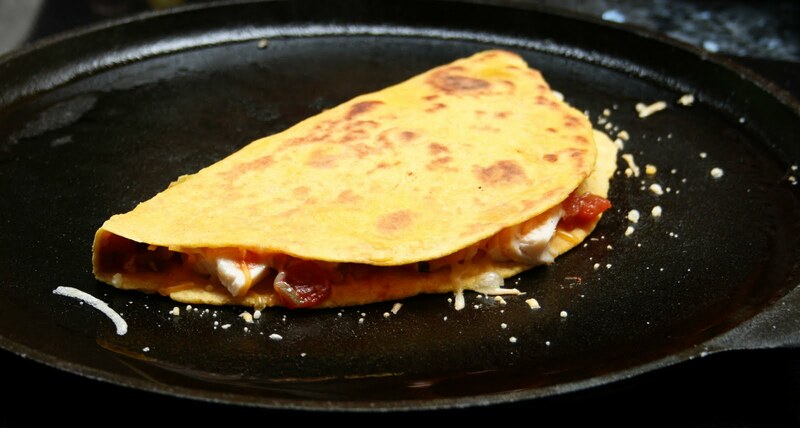 Shake the skillet a little to slide the tortilla around if it gets too puffy. Flip every 15 to 20 seconds—it shouldn't take more than a minute or so. Wrap cooked tortillas in a kitchen towel to keep them warm and soft, or store in a tortilla warmer while you cook the remaining tortillas. If you have leftovers, store them for up to a week in the refrigerator in a zip-top bag or airtight container, or in the freezer. Variations: To make different flavors, substitute tomato paste, roasted red pepper, or spinach for the pumpkin. You may need more or less of those ingredients — experiment to suit your own taste. Just be sure to blend it thoroughly into the water so you have a total of 3/4 cup of liquid. This is killing me. Looks so good. I love the idea of using pumpkin in a tortilla. Sounds absolutely delicious!